Scientific Method and Experimentation: Prove It! 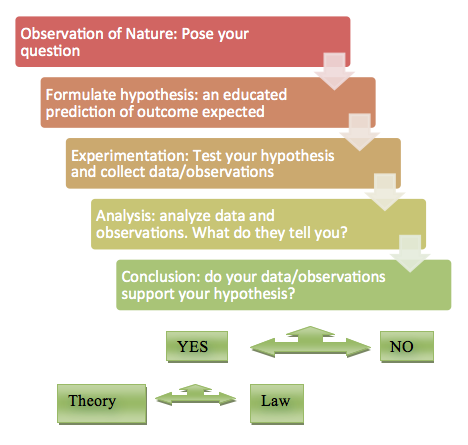 Scientific Method is a structured and organized series of steps taken in an experiment to ensure a consistent, reproducible, and controlled outcome. What’s the difference between a theory and a law? Scientific Law: a statement that describes a relationship between phenomenon that has been consistently observed through experimentation. Laws may be expressed either mathematically (in equation form) or in stated. Scientific Theory: an explanation of observations in nature that have been substantiated over time. While there is significant data and observations to support theories, they still have their detractors (evolution, Big Bang, etc) and not easily observable like laws. Don’t discount theories, however, as they are a mainstay of scientific literature. Example: Einstein’s Theory of Relativity (who’s going to argue with Einstein?) of time and space as relative rather than absolute. This is difficult to “observe,” and therefore show definitive proof, unlike a law.